IPS has teamed up with Proframe! Industrial Plastic Shapes has teamed up with aluminium deck framing company Proframe to bring yet another innovative solution to the decking market. Combining our Futurewood composite decking with Proframes aluminium subframe, we are able to offer the quickest to install and most cost-effective pairing of products in the decking market today. Futurewood is the only New Zealand composite supplier with a clip custom designed with Proframe’s aluminium deck framing in mind. Together these products offer the perfect solution when it comes to finishing floating decks over waterproof membranes and low-level decks over concrete pads. The one size, 70mm x 45mm extrusion is manufactured from structural 6060 T5 aluminium alloy right here in New Zealand. It is finished with matt-black powder coating and carries a 15-year warranty which is in line with our warranty on Futurewood. The same profile is used as both the joist and bearer, connected using two brackets – a right angle and a straight joining bracket. Both the decking and aluminium is available in cut to size lengths reducing waste significantly. The engineered design allows for deck heights as low as 70mm over a membrane or concrete surface and will support Futurewood ™ composite decking while providing impressive span capability. To ensure installers can allow for on-site dimensional variations, the system is designed to be constructed onsite, simply put, you are cutting a frame on site, that will always fit the space available. Industrial Plastic Shapes are proud to introduce our FutureJack decking pedestal to complement our Futurewood composite decking. 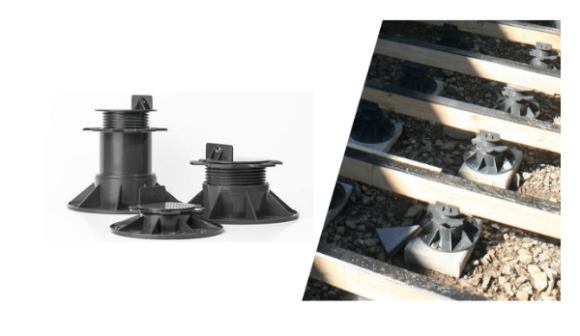 Unlike most adjustable pedestals, FutureJack is manufactured using UV stable ABS plastic which offers one of the highest levels of compression resistance available in the market, perfect for any decking application. When designing the FutureJack, we were conscious that we wanted a simple pedestal with few parts that would cover most decking scenarios and preferably being able to use one profile to cover an entire project. This we achieved and can offer one item that is adjustable in situ, using our counter thread technology, with no need to purchase bits and pieces to build up to the height required. This means no more boxes of components left over after each job and not knowing when you might be able to use them next. Not only is the FutureJack perfect for standard decking applications, it’s also perfect over concrete slabs or sitting on a concrete paver over a muddy backyard. Our smallest FutureJack at 30mm high can sit neatly against the house as it has a very small base which enables you to get very close to any structure. We also offer a rubber pad to sit under the FutureJack should you require it. So when you order our FutureJack, it will be already made up and ready to use on site. Below are the sizes we offer ex our stock.